Thomas Sterling (sometimes credited as Thomas L. Sterling) appears to have made his initial impression on the crime-fiction world in 1951, when his book The House Without a Door (1950) received an Edgar Award nomination in the category of Best First Mystery Novel by an American Author. He didn’t wind up winning; the honor that year went instead to Thomas Walsh for Nightmare in Manhattan. However, Sterling enjoyed some prestigious company in the losers’ circle--Patricia Highsmith, whose psychological thriller, Strangers on a Train, was also passed over by the Mystery Writers of America judges in favor of short-story author Walsh’s debut novel. Four years later, Sterling came back with The Evil of the Day, a character-rich murder mystery set in Venice, Italy, that was later retitled Murder in Venice for paperback publication. Brett Halliday--the creator of Miami gumshoe Mike Shayne--called Evil “a sterling tale with high suspense, biting satire, and sharp-edged humor in about equal quantities--and a sheer delight throughout!” The New York Times was no less glowing in its assessment, describing the work as “one of the few practically perfect murder novels of the decade.” Both of those sources were being a tad hyberbolic, I think, though this novel does hold many attractions. Sterling’s story is evidently modeled on English Renaissance dramatist Ben Jonson’s 1606 play Volpone, “which concerns a Venetian nobleman (Volpone--Italian for ‘Fox’) who enlists the aid of his servant (Mosca, or ‘Fly’) to fake an illness and dupe three individuals seeking his fortune into thinking he has died and left them his inheritance.” In The Evil of the Day, Englishman Cecil Fox--supposedly on his death bed--summons a trio of people from his past to his Venetian estate. There they are greeted by William Fieramosca (his last name translated into English as “Proudfly”), an American actor who came to Italy to take part in a film, but wound up laboring as a stage manager, and eventually as Fox’s private secretary. As Fieramosca tells his employer’s guests, Fox “wishes to die--I think we must use the word as frankly as he does--with his closest friends around him.” Oddly, though, the two distinctly unimpressive males, Anson Sims and Henry Voltor, and the wealthy but perpetually complaining woman, Mrs. Sheridan, who have traveled such a great distance to see Fox off in the Veneto capital don’t appear to be his closest friends at all. In fact, they seem to care for little more than Fox’s money, which he’s promised to bequeath to each of them, setting up a three-way rivalry that can only lead to trouble. And trouble is certainly what ensues, as secrets are slowly revealed, a murder is committed, and the Venetian constabulary, in the form of middle-aged Maresciallo (or Marshal) Rizzi, plods in to question everybody concerned, especially Mrs. Sheridan’s young traveling companion, Celia Johns, who may know more about the crime than she realizes. I’m not going to spoil the story by telling anything more. 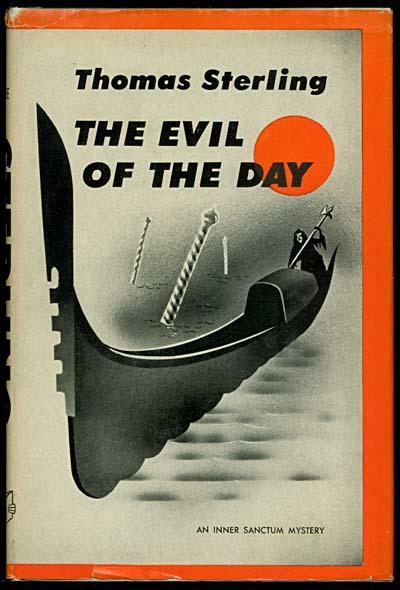 But I have to mention that in 1959 The Evil of the Day/Murder in Venice was adapted for the London stage by Frederick Knott as Mr. Fox in Venice. And in 1967, director Joseph L. Mankiewicz used Jonson’s Volpone and Sterling’s novel as source material for The Honey Pot, an “overcomplicated, talk-infested” crime-comedy film that starred Rex Harrison, Cliff Robertson, and Maggie Smith (who, understandably, looked much sprightlier than she does in her present dowager-countess role on the British TV series Downton Abbey). Of course, what we’re principally interested in here at Killer Covers isn’t the plot line of a novel, but its exterior wrapper. 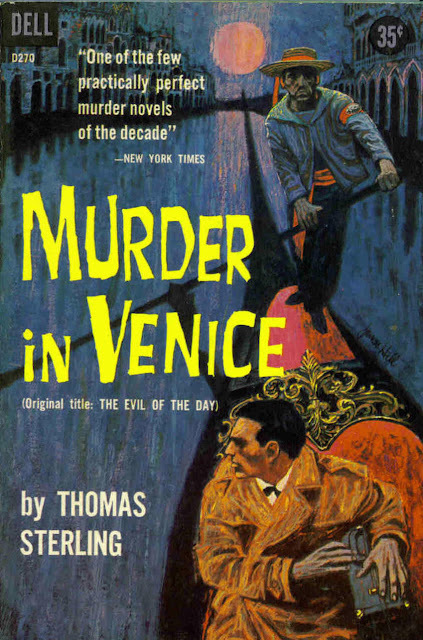 The atmospherically eerie illustration for the front of Murder in Venice, embedded atop this post, is credited to James Hill, a Canadian artist about whom we’ve talked previously on this page. 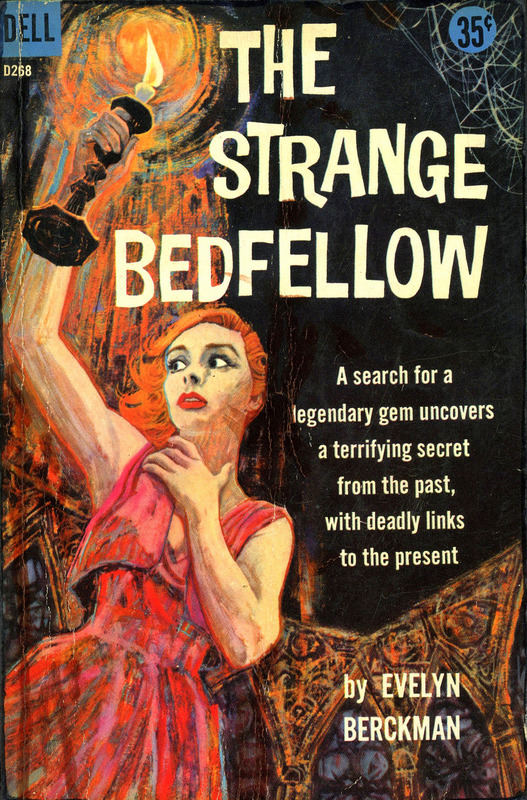 Over his many years in the business, Hill created covers for works by Leslie Charteris, George Bagby, and Vladimir Nabokov, as well as Evelyn Berckman, whose 1956 novel, The Strange Bedfellow (later released as Jewel of Death), carried another Hill painting on its 1958 paperback edition, shown on the right. As the last book was modeled upon “Volpone,” so this takes its theme from “Camille” (or “La Traviata”). Mr. Sterling creates, in Maggie Lefevre, a wholly captivating, exasperating and unforgettable courtesan, whose sisterhood Marguerite Gautier (or Violetta Valery) would smilingly acknowledge. He’s created her so well, indeed, that she refuses to fit the puzzle-plot, whose solution I plain do not believe--but that is a small fault in so charming and glittering a novel of resort life near Naples. If anybody reading this has more information about Sterling and his work as an author, I hope you will share what you know in the Comments section below. This novel in french version,on my blog, "suspense story" category.